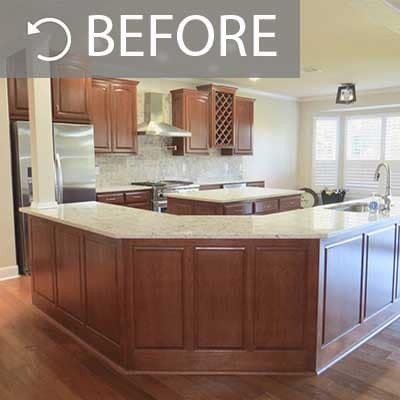 We love “before and after” kitchen painting transformations! Scroll down for our design notes and helpful colors. These projects are why we love what we do! or read more about our kitchen cabinet painting services! This stunning remodel by Haven Design and Construction features the perimeter cabinets painted in Sherwin Williams SW 7005 “Pure White”, and the black island and range hood in Benjamin Moore BM 2133-10 “Onyx”. We love how the glass-fronted doors in the upper cabinets are black, while their frames are white! Photo by Matthew Niemann Photography. A bright, modern update! We love this kitchen’s fresh, retro vibe. Even if your cabinets were just a bit “blah” but not abysmally dark beforehand, a fresh color can make all the difference. One of the most dramatic transformations by Abode Interior Design! This hacienda-style Spanish kitchen was oversaturated with dated colors. Gina Roth of Abode brought us in to help update the whole space, cabinets and all, in this fresh, lovely white. Love the hammered copper sink and the two island countertops! This entire house was painted in dark, out-dated greens and burgundies. It didn’t help that the cabinets were this heavy golden oak. We painted the walls in Benjamin Moore BM “Ballet White” and the cabinets in BM OC-45 “Swiss Coffee” – the perfect soft white for kitchens with a natural stone backsplash like this travertine. This homeowner had already updated the counters and backsplash when we arrived, but the new marble countertops and subway tile were not enough to give this kitchen the fresh, white look our client wanted. We painted the cabinets in Sherwin Williams SW 7005 “Pure White” – perfection! There’s another view of the cabinets on our Cabinet gallery page. This Lakeway home near Austin screamed “outdated Tuscan” style – especially the red stained cabinets. We painted them in Benjamin Moore HC-166 “Kendall Charcoal”, in a flat sheen (most cabinets are done in satin or semi-gloss). This deep, rich color looks stunning in a high gloss, but we love how the softness of the flat sheen gives this kitchen a custom, sophisticated style. These cabinets were a very strong red tone that didn’t go at all with the homeowner’s light, fresh aesthetic. Austin interior design firm Triple Heart Design selected the Sherwin Williams color SW 9171 “Felted Wool”, which we painted on the cabinets in a soft, satin lacquer. This adorable kitchen was a real mess! The homeowner removed an outdated tin backsplash, moved the fridge to the right of the sink, and extended the row of cabinets to the left. We painted the walls in Sherwin Williams SW 7029 “Agreeable Gray”, and McGovern Woodcraft built the cabinets and open shelving. The epitome of modern farmhouse! We love the visual impact of updating a backsplash like this homeowner did – it occupies so much vertical space, it’s the second-most impactful change you can make after painting your cabinets. For those, designer Julie Risman of the Inside Story Design selected Benjamin Moore’s BM OC-117 “Simply White”, which is just soft and warm enough to coordinate with the backsplash and countertops. The new hexagonal backsplash tile in this kitchen, along with the classic white we painted on the cabinets, honor this historic home’s “fresh vintage” vibe. Carrying the tile all the way to the ceiling and casing out the window is a nice design touch. Removing the heavy overhanging light fixture/overhead storage made a huge difference in this kitchen! So did painting the dark stained cabinets in Benjamin Moore’s BM OC-117 “Simply White” – a popular color with our kitchens! These yellow pine cabinets were painted in Benjamin Moore BM OC-117 “Simply White”, the island in BM 1586 “Silver Mink”, and the walls in BM HC-172 “Revere Pewter”. In this case, the backsplash was also the original pine, so we painted that as well. Rarely have we seen a kitchen look so completely orange! We painted the cabinets in Benjamin Moore’s BM OC-130 “Cloud White”, the island in BM CSP-85 “Tweed Coat”, and the homeowner installed a white subway tile backsplash (and carried it all the way to the ceiling above the sink, on our recommendation!). These dated cabinets sure put the “gold” in “golden oak”. The homeowner wanted to retain the stained wood look, so rather than paint them a solid color, we toned the cabinets with sheer layers of dark tinted lacquer, to achieve the look of darker stained wood without the lengthy mess of having to strip the cabinets. Much better! This homeowner wanted her cabinets glazed in a soft white, to soften the hard look of the wall of cabinets. The kitchen felt truly cave-like before, but painting the cabinets in an off-white (lighter than the desired final look), then glazing them with a soft gray-brown glaze, made it feel welcoming and open. See our Facebook, Houzz and Google+ pages for our latest kitchen painting and refinishing projects! And don’t forget to check out our blog for answers to your most-asked cabinetry and kitchen painting questions.